Thank you for your tireless support in 2018—whenever we reached out to the Breast Cancer Action community you answered with your voice, your time, and your donations. 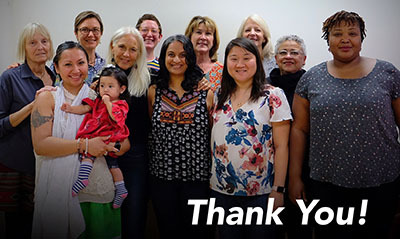 Thank you for not only helping us surpass our fundraising match in the final days of 2018, but for all the big and small ways you stepped forward throughout the year to demand health justice for women at risk of and living with breast cancer. As we kick off 2019, we’re stronger because of your support and generosity. Our fierce independence, thanks to members like YOU, ensures that we are never compromised in our work and we can always focus on the root causes of the disease, without worrying that corporate donors are pulling the strings. We have a lot of work ahead of us—we’re preparing to make waves and continue to push the conversation by telling the hard truths about breast cancer. We’ll keep pushing for an end to fracking and dangerous drilling. With a new Governor in California (the nation’s largest oil producing and agricultural state) we’re preparing to hold the line and continue calling for an end to practices that pump dangerous chemicals, shown to cause breast cancer, into our water and soil. We’ll be there to provide compassionate, evidence-based, information and resources free of charge to anyone who needs it, so that everyone is able to make their own informed and deeply personal health decisions based on their individual priorities and values. We’ll stand strong in our demand for breast cancer screening, diagnostics, and treatments that are evidence-based, more affordable, more effective, and less toxic. We’ll be ready to challenge pinkwashing and the hypocrisy of the breast cancer industry with our annual Think Before You Pink® campaign. We’ll continue to hold our regulatory protection agencies accountable and we’re going to give it everything we have to make sure we don’t lose any ground. We’ll be speaking out and mobilizing our community to demand that agencies like the EPA and the FDA put public health before corporate profit. We’ll do all this and more, thanks to your generosity in 2018 and your ongoing support. On behalf of everyone at Breast Cancer Action, I wish you all a truly Happy New Year. If you weren’t able to make a gift at year-end, it’s not too late! Together we can work toward a world where lives and communities aren’t threatened by breast cancer.